To understand antique prices and antique values you have to understand and love antiques as do we. 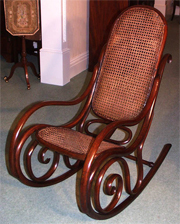 First, we absolutely love fine antiques and collectibles, especially American antiques and American antique furniture. These "things" make us all warm and fuzzy inside. Pieces that have withstood the test of time and that represent our history and our legacy. The construction, design and finishing of early American antique furniture to us represents an artform long gone. We collect them, use them and live with them, and look at them with respect for their history and for their value. I love to watch the looks on my associates' and consultants' faces when they gaze upon a truly authentic piece of American antique furniture that is in pristine condition. The co-founders of this site came from parents who collected and loved antiques. They taught us a great appreciation for their character and beauty. We lived with them growing up. As youngsters they were just furniture or objects or things. But over time we all developed a real appreciation for their beauty and value. Contemporary furniture, as functional and beautiful as some of it truly is, took backstage to the authentic antiques we grew up with (though it stood me through college quite nicely). When our parents passed on we had to sell much of what had been collected over the years. Now that was a difficult thing. The thought of parting with some of those pieces was heart wrenching. Who would one turn to for help? A dealer? An appraisor, auctioneer or consignment shop? How would I know if I was getting a fair price for these now precious antiques? Antiques Perceived Value versus Real Value (Price!) - What makes an antique valuable? In many cases the perceived value to you of your antique furniture or collectible is greater than the monetary value (price) to a stranger. And why not? Your father bought these items 40 or 50 years ago and he surely loved them. You grew up with them. Or Grandma left them to you - that 150 year old rocking chair she always sat in - you can still remember her in that chair. You dearly loved your grandmother, and this precious memory magnifies the value of that antique in your mind. But that vase, jug or chair you love will not fetch near the price you feel it's worth. But wait a minute - maybe it will fetch more! Don't most of those items that people bring in to Antiques Roadshow surprise the bejeezes out of people when the expert tells them they can buy a new house with the vase Grandma left them? Perhaps "Antiques Road Show" has given us a false sense of the ease of selling our antiques for their fair price. Subscribe now and you won't miss a single issue on this important subject. As a direct result of the difficulties encountered in selling our parents' beloved antiques, our special love for antique furniture in particular, and a recognition that perhaps we could have some real fun while helping people similarly smitten by antiques, we decided to start this web site. We could not find another site that catered to individuals who wanted to sell their antiques at a fair price, buy antiques privately, or simply show off their valuable antiques and collectibles. In order to make this site an authoritative and valued source, we realized that we had to surround ourselves with an expert team of consultants. 4AF's Consultants will be among the most important members of our web site team. They'll be our local touch to visitors with questions about their antiques value, prices, and authenticity. We are in the process of building consulting relationships with experts in more than 50 cities nationwide. If you are an accredited ASA Appaiser in Antiques/Furniture, a Master in Furniture Retoration, NAA, ASA, ADAA or NAADAA Member, or similarly accredited by reason of experience, and wish to consider partnering with us as a local consultant, we sincerely invite you to complete our Partner application today. When you see the 4AF Certified seal, it means that one of our consultants has inspected and authenticated a particular item. Furniture is at least 100 years old and is in original condition. Unless otherwise noted, it is not refinished or restored, and displays its original hardware. Keep in mind that authentic American antique furniture typically bears some indications of wear and use.